Liquor stores can be a very stable option for those looking to acquire a business of their own. But just like any other business, liquor store owners who are more likely to succeed work hard, are dedicated, and have a solid understanding of the business and its potential pitfalls before they jump in. So while this article is not meant to deter you from buying a liquor store, it does point out six very important things to consider if you’re seriously considering getting into this business. The front-end operations of a liquor store—the human interaction, building supplier relationships, setting up of wine displays, etc.—are often the appealing things that draw people to this business. It’s important to remember, though, that a lot is required on the back-end to keep your operation running smoothly. Obtaining the necessary licenses to operate a retail liquor store has become increasingly complicated and costly over the past several years. So much so that these issues often become the catalyst for store failure, or an owner selling his or her business. It’s important to understand that every city, county, and state has a different set of laws and guidelines. You’ll need to understand your location’s laws inside and out. For example, in some states, licenses can be transferred from one owner to the next fairly easily; in other states, each new owner of a retail liquor store must apply for a new license. Some areas place moratoriums on new licenses, which often means a store can’t be sold at all. 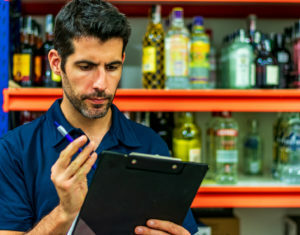 The bottom line: Before you get too far into the process of buying a particular liquor store, make sure you understand the specifics—including costs—related to licensing for that particular location. And speaking of location . . . The location of your liquor store will determine its fate, not only because of potential licensing issues, but for obvious reasons related to traffic and competition. If your liquor store is one of five in a three-mile radius, then you may be forced to compete solely on price. Doing so makes reaching profitability considerably more difficult. But provided your store offers a wide selection of products and offers extras like lottery and tobacco, location will matter a bit less. The better and wider your selection, the more edge you’ll have over even some of the lower-priced competition. Stocking up on inventory requires a substantial upfront investment. This is one of the aspects of liquor store ownership that most often catches new owners off guard. Some liquor stores include inventory in the sales price—but this isn’t always a good thing. Make sure you check out the inventory age to determine if there’s a reason it’s still on the shelves, and if you’ll have trouble selling it yourself once you take over ownership. It’s no secret that poor bookkeeping and skimming cash are hallmarks of the liquor store business. If this has been the practice at the liquor store you’re considering buying, it can be nearly impossible to determine its profits. It’s imperative that the owner of any business prospect allows you to review the financial and tax returns for the business, and that anything that seems suspect is addressed. It’s always wise to involve a financial, tax, or legal professional in this phase of your due diligence. There is a difference between an owner who’s just not very good at bookkeeping and one who is intentionally misrepresenting the income or profits of the business. If the issue is the former, it is possible to reconstruct those financials. However, if a seller is unable to provide you with ample documentation, then it’s wise to move on to the next opportunity. There are plenty of financially-healthy liquor stores for sale where the owners have kept all of the financial and other records up-to-date. If you’re looking for a business that can flourish with absentee ownership, then liquor store ownership probably isn’t right for you. Liquor stores deal with lots of cash sales, expensive and in-demand merchandise, and typically require long working hours. Those long hours can make it tempting to entrust an employee with more of the integral operations, but this can pose a big risk to your business. It’s best to be as personally involved as you can, or ensure that a family member or employee you trust implicitly is always on hand to oversee cash registers and store inventory. And if nothing here has scared you off, then you are likely a good candidate for liquor store ownership. Bruce Hakutizwi is the U.S. and international manager of BusinessesForSale.com, a global online marketplace for buying and selling small- and medium-sized businesses. With more than 60,000 business listings, the marketplace attracts 1.4 million buyers every month. Bruce manages business development, content building, client acquisition, and customer retention in the United States, Canada, South Africa, and Europe. Bruce frequently writes on topics that promote entrepreneurship and small business ownership.